The art of accessorizing was established years ago by the ancient Greeks, who were experts in design, scale and proportion. Accessorizing your home is the final (and fun!) step in the home staging process. Typically, when you decorate your home, you design according to your personal style and taste. But when you're selling your house, you need to consider what kind of home design appeals to the greatest number of buyers. Sell your home fast by highlighting special features and focal points with artwork and accessories. Accessories should enhance the furniture and architecture of your home design, tie the room together and enliven the space. Before you begin staging your house for sale, read the rules below about the art of accessorizing to learn basic interior home design ideas that professionals use. 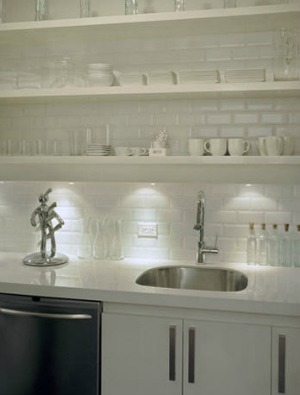 Accessorizing your home can be a challenge, but gratifying when done correctly. These guidelines should help those who are timid about making home design choices. Let's look to the ancient Greeks for advice on design, scale and proportion. The Greeks discovered long ago that using the following ratios and proportions in design is most pleasing to the eye. These rules still apply today in the art of accessorizing. The "golden section" rule applies to ratios often used in architecture when designing window proportions and room sizes. The golden section is useful to know when accessorizing your home as well. Some common ratios: 2:3, 3:5, 4:7 and 5:8. If you have a 5 foot wide fireplace, (as pictured on the right) hang a 3 foot wide picture, grouping of pictures, or mirror above it. 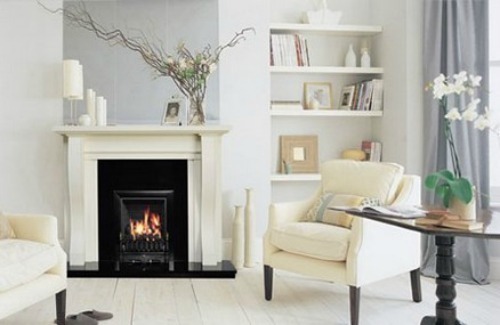 If you were to hang a 6 foot wide mirror over the fireplace, it would look top-heavy and looming. Artists and photographers are all familiar with the "golden mean" rule. The golden mean principle recognizes that the most pleasing arrangements require dividing the length of an area between 1/2 and 1/3. For example, if you're creating a vignette, avoid placing it directly in the center of a table or shelf. Placing accessories off-center is ultimately more pleasing to the eye. In the art of accessorizing, the Greeks also discovered that grouping objects in odd numbers is more pleasing to the eye than even numbers, as the result appears less studied. For instance, placing candlesticks in groups of 3 or 5 will look much more interesting than in pairs. The number three is most preferable. Too many objects in a grouping or vignette, can look cluttered and busy. Three pillows on a sofa will look better than two. When you buy pre-packaged bedding, you'll often find accent pillows in groups of three and in different sizes or styles. I had one art teacher who referred to the different sizes as the daddy, mommy and baby-- easy to remember. Watch this video by John Mangano of Homestagingchannel.com for home design tips on arranging furniture and accessorizing a living room, using the principles of the golden section, odd numbers, scale and balance. Try to avoid being too matchy, which is safe, but boring. For instance, a grouping of aqua vases of the same shape and height would be dull. But a grouping of aqua vases in different shapes and heights would be interesting. The aqua color would unify the group, while the differences would create interest. The triangle, or pyramid, is a basic form in the art of accessorizing. Imagine a triangle in the spot where you want to put your arrangement. Place an object at each point of the triangle. Each object should vary in height and width. Place the tallest and most substantial piece at the back, and slightly off center. Set the middle sized object in front, but off to the side. Lastly, place the smallest in the front. Be sure to overlap objects so that each can be seen. See how to make a vignette. The same principle applies when using more than three objects. Always stand back and eyeball your arrangement. If it looks too cluttered, try new combinations, use larger objects, or remove something. Maintaining proper balance, scale and proportion is also important in the art of accessorizing. Balance your art and accessories throughout a room. Don't place everything on one side. This is especially important when using color; scatter your accent color in at least three places around a room to create visual movement. Scale usually refers to the size of an object in relation to the human body or to the room itself. Proportion refers to the size of an object relative to other objects in a room. To demonstrate how scale and proportion work together, think about how a lamp shade should be in proportion to the lamp base, and the lamp should be in scale with the table it's placed on. Small accessories clustered together or scattered throughout a room will look like clutter from a distance. Plan on using medium to large-sized accessories for your home staging instead. Larger accessories will be noticed and seem more important as you enter a room. Follow the advice of HGTV's Sabrina Soto when selecting accessories; Don't use anything smaller than the size of a cantaloupe! 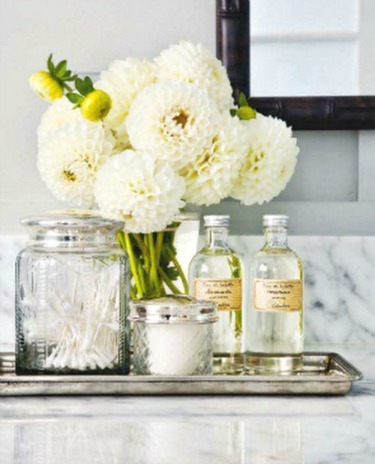 ﻿Creating arrangements on shelves, countertops, tabletops or dressers can be tricky. You want to show off your accessories, but you don’t want the end result to be cluttered and unorganized. Don’t clump too many objects together. Simple is always better in the art of accessorizing. Too many small objects will look cluttered and insignificant from across the room. Remember to group objects in odd numbers rather than even. If you want symmetry, start by putting two items of equal visual weight on each end. Then add various pieces of different color and height for interest. Step back to see if both sides of the shelf are balanced. You will know if its unbalanced-- one side will seem visually heavier than the other. Don’t place objects in a straight line on a shelf. Put some items slightly in front, others in the back. This will add depth to the display. Remember to group in threes and fives, and place the tallest objects in the back, smallest in the front. 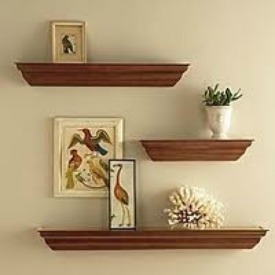 For instructions on hanging floating shelves, like the ones in the photo, go to hanging artwork and mirrors. Each item that you place in a room will have what is called, “visual weight.” Visual weight refers to how much weight an object APPEARS to have when you look at it, not how much it actually weighs. Visual weight can refer to color, patterns, textures, design and the shape or structure of an object. This concept is important to know, whether you are arranging furniture or accessorizing a room. For instance, a black leather sofa will visually outweigh a white leather sofa of similar weight. Begin your accessorizing by locating the focal point in a room. For a living room, this could be a fireplace, a beautiful window, or other architectural feature. The art of accessorizing would not be complete without discussing vignettes. 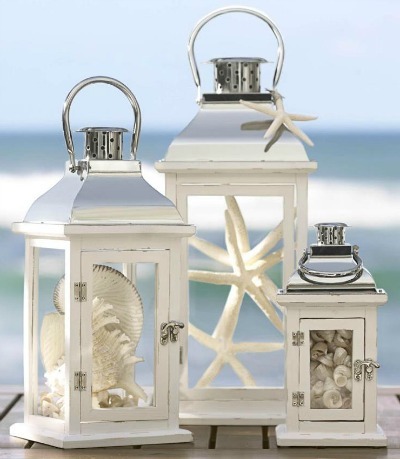 A vignette is a group of accessories designed to compliment a room's function or decorative details. 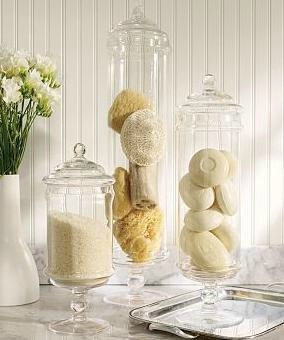 Vignettes are "scenes" created by combining a mixture of decorative objects into delightful arrangements. 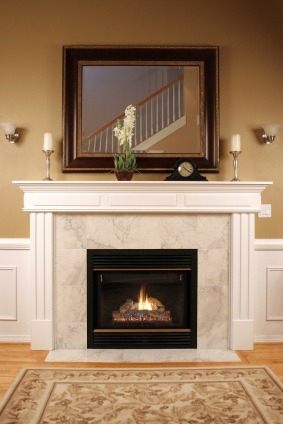 Vignettes can be displayed on tabletops, shelves, fireplace mantles, kitchen counters, bathroom countertops and so on. For more details on making vignettes, go to how to make a vignette. Feng shui (fung shway) is an ancient Chinese design philosophy that is all about creating harmony and stability in a space. See feng shui home staging for feng shui tips on applying this philosophy to your home design. The ancient Chinese were, in some ways, the very first home stagers, as one of the basic design tenets of feng shui is getting rid of clutter. Feng shui advocates believe that a cluttered home has bad energy. When home buyers walk into a house full of clutter they are sure to feel that tension. Feng shui is also concerned with color palettes and furniture placement in the art of accessorizing. Certain aspects of feng shui should NOT be integrated when staging a home for sale, such as the practice of hanging crystals from the ceiling. 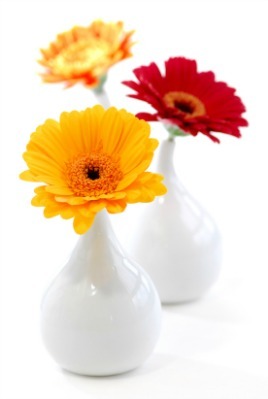 Feng shui principles can often conflict in the art of accessorizing when home staging.